Home » Jeweled Geese Leftovers! Posted by Automagically imported from Blogspot on April 3, 2009 in Uncategorized | Comments Off on Jeweled Geese Leftovers! 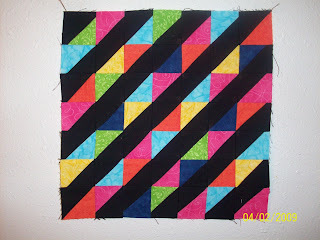 Here is a photo of my block using the cast off corners from my jeweled geese blocks. It was very tedious work. I think I will add it to my ziploc of orphan blocks. I admire anyone who can make a miniature quilt.